Kage Baker was a great admirer of those who master crafts. She was picky about what she considered a worthy “craft”, though. Summer afternoon projects at the grammar school down the hill did not make the cut. All those badly (and barely) whittled balsa wood and Tinkertoy race cars; pleated fans; log cabins made of popsickle sticks – good enough to keep a dozen neighborhood kids busy for a few hours, but not up to Kage’s standards. Most of those masterpieces only went home because they’d been accidentally glued to their maker’s hands. None of the crafts recommended in ladies’ magazines in our adulthood were acceptable, either. Kage already knew how to strip and re-paint wood – we learned how to do that to anything from enormous wardrobes to moulding in our childhood, via direct parental instruction. Both Kage and Kimberly could apply gold leaf, devise a fake wood grain, make florist’s foam into hewn rock … not me, though. There’s a reason I took up knitting: I’m a disaster at most other skills. Textiles sing to me. Everything else mumbles and won’t give me its right name. Late in her life, she decided to take up darning. This was so she’d have something to do while she was sitting in our Parlour during Dickens Fair. All my ladies (and some of the men) like to knit, crochet, tat and bead things at quiet moment; we have a family table where we sit when the joint is not jumping and work on our various projects. Kage got interested in darning eggs, and decided to take up an adjunct skill to my knitting. Besides, Fair people go through socks at a dreadful rate, and it was skill that would have been useful and fascinated the customers. She ran out of time, though. I think I may now have found something that would have interested her. God She knows, it’s enthralled various people looking over my shoulder at the pattern, and at least one other knitter – so I will give it a try. I have had pointed out to me (thank you, Athene!) 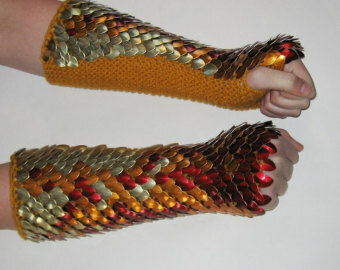 a pattern to knit scale mail gloves. All of you, Dear Readers, know what chain mail is. Most of you probably know what scale mail is as well; but for the rest of you – it is mail whose fabric is made not of conjoined metal rings, but of overlapping metal scales. In pieces designed for actual battle, the scales are connected with metal rings, or fastened to leather with same. It’s an intermediate armour between chain and plate – it’s also lovely to look at and usually nicely supple. My knitted pattern is to make gloves that are pretty much just decorative. I intend to knit them, though, out of Lion’s Brand Stainless Steel, which is a high quality wool that has a steel thread plied into it: so they will not be only pretty. The first pair will be for me, so I can work out the bugs and take care of the “first item” law that makes you screw up the first slice of pie or first hand-knitted sock. No one else will have to put up with gloves with crumbled crust edges and leaking filling, hopefully. Kage would have loved these. She would have wanted to be eventually accoutred like a veritable dragon, I have no doubt; and I’d have done my best to accommodate her. It would have been irresistible. At the very least, a pair of good scaled gloves would have kept her hands warm while she typed. And the glitter would have delighted her – who knows what amazing stories might have poured through her hands, armoured in shades of scarlet and gold? I’m going to have to get that pattern. It looks spectacular! It’s on Etsy, under CraftyMutt – it’s only a few bucks, and all she asks is that you not sell any of the gloves you make. Give ’em away, fine with her. I have a dear friend who does not knit – but who is fascinated knitting patterns. She sends me the neatest ones, and I must say – she finds the best, much better than me! Michael is agitating for a shirt, too.